An essential problem in nonparametric smoothing of noisy data is a proper choice of the bandwidth or window width, which depends on a smoothing parameter \(k\). One way to choose \(k\) based on the data is leave-one-out-cross-validation. 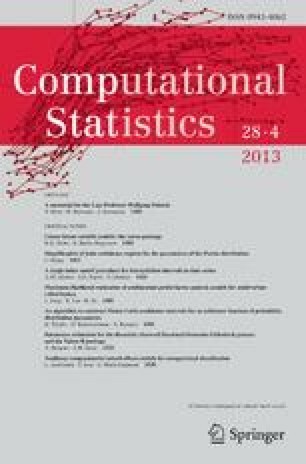 The selection of the cross-validation criterion is similarly important as the choice of the smoother. Especially, when outliers are present, robust cross-validation criteria are needed. So far little is known about the behaviour of robust cross-validated smoothers in the presence of discontinuities in the regression function. We combine different smoothing procedures based on local constant fits with each of several cross-validation criteria. These combinations are compared in a simulation study under a broad variety of data situations with outliers and abrupt jumps. There is not a single overall best cross-validation criterion, but we find Boente-cross-validation to perform well in case of large percentages of outliers and the Tukey-criterion in case of data situations with jumps, even if the data are contaminated with outliers. This work has been supported in part by the Collaborative Research Center “Statistical modeling of nonlinear dynamic processes” (SFB 823) of the German Research Foundation (DFG). The helpful and stimulating comments of the referees and the associate editor is also acknowledged.